THE SKIN OF OUR TEETH. Photo by Petronella Ytsma. There are plays that are so good that audiences enjoy them even if the production isn’t first class—Midsummer Night’s Dream for example. Then there are plays that are unwieldly gems, difficult to take in unless the production is of first-class quality. The comedy-drama The Skin of Our Teeth by Thornton Wilder is such a play. It’s layers of parallel time and interweaving of storylines makes it hard to pull off. The good news is that director Joel Sass and Girl Friday Productions put a shine on this multifaceted jewel now at Park Square Theatre‘s main stage. 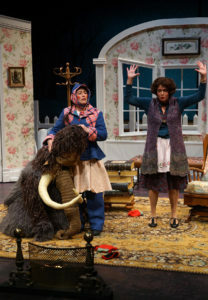 The play centers on the Antrobus family, George and Maggie and their two children in modern day New Jersey where they live with a pet mammoth and dinosaur and a scatterbrained maid named Sabina. In the course of the first act George invents the alphabet and the wheel. It is broadly hinted that their son “Henry” is the biblical fratricide Cain. We learn that the nearby grocery store has run out of food due to a glacier that is coming their way. These surrealistic elements, grounded in silliness and humor, are what Skin of Our Teeth is founded on and what director Sass calls a “a screw ball tragedy” in his program notes. What makes this show work so well is that the actors know when to drop their madcap expressionism and bring the pace down to a serious level in order to survive the crisis at hand. They demonstrate the wise and very human core in this play that lies underneath the shifting layers of story and time. The strong cast is led by John Middleton as George Antrobus, Kirby Bennet as Maggie and Alayne Hopkins as their maid Sabina, all excellent in their roles. This is one of Middleton’s best performances as he plays George Antrobus as a happy tinkering inventor rather than an intellectual powerhouse. Bennet gets stronger as the play progresses doing excellent work in each succeeding act. Sabina is written as a show-stealing part and Hopkins is very good at upstaging everyone else when the script demands it. Neal Skoy and Kathryn Fumie as the Antrobus children, Henry and Gladys, do very well as they age considerably throughout the course of the show. Skin of Our Teeth won the Pulitzer Prize more than 75 years ago. If anything, its message is even more applicable now. As we teeter on the brink of environmental collapse I expect that this play will have more productions but there may be none better than the one now at Park Square Theatre. A deliciously weird play. One wonders how it would go over in today’s theatrical atmosphere. As Mari points out, “As we teeter on the brink of environmental collapse… this play will have more productions.” I sure hope so.